Anna Lawrence, a confident high-school student proud of her artistic ability, decided to share a detailed sketch she had made of a Labrador with her Instagram friends. It wasn’t long before she realized that the followers of her Instagram found her Labrador portrait to be more than just a ballpoint-pen doodle, but rather a work of art worthy of a price tag. Charging 50 dollars each, she began accepting requests for dog portraits from friends, colleagues, and unacquainted spectators. This is not a tale of turning nothing into something, but rather a story about someone who took action when she discovered that people will gladly pay for her product, which she has the ability to single-handedly produce. Anna’s artist reputation within the community began to grow, as her talent to capture the unique likeness of their pets increasingly impressed her clients. Instead of confining herself to the dog portrait genre, Ms. Lawrence has used her foundation as a jumping off point for her artist career. She enthusiastically accepted any opportunity to apply her skills to a variety of requests from art patrons within her community. She created an album cover for a bluegrass band, as well as their merchandise logo. She designed a custom tattoo for an individual who also commissioned her to create paintings related to the tattoo. Anna developed effective communication and negotiation skills by working ethically with her clients, always producing artworks that impress and selling them at a fair price. Due to her momentum and the dedication she has to her craft, Anna was selected as a winner of the 2018 U.S. Congressional Art Competition. Her work is currently on display in the U.S. Capitol Building. Through Anna’s self-employment journey, she has learned a multitude of qualities that she can apply toward fully developing a business of her own one day. She has come to realize her potential and is setting her sights on claiming her future role as a professional in the art world with a major in Graphic Design. 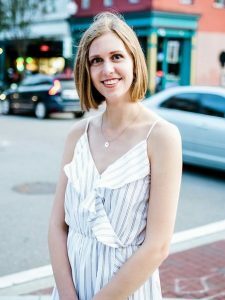 To surround herself with like-minded people and gain a broader understanding of the art world, Anna is currently volunteering at the Cameron Art Museum. She has positioned herself where she can interact with artists and art consumers, and learn how art is displayed and sold. She is eager to learn what else she can do as an artist and has taken the initiative to start teaching herself. To expand her knowledge and perception of the professional art world, she understands the importance of continuing her education and earning a degree. She is currently enrolled as a freshman in her local community college, but intends on transferring to an art university for Graphic Design next year, where she will continue to focus on her passion. Anna has been quite resourceful in trying to meet the financial requirements needed to enroll in the art university she has chosen. She continues to accept art commissions, display her work in coffee shops and galleries, and sell prints of her drawings. Self-employment has allowed Anna to maintain a good academic record because she can schedule her work around her classes. Despite her hard work, her earnings are not quite enough to cover the heavy costs of university tuition. At ChooseWhat we recognize and affirm Anna’s efforts, drive and potential, and are delighted to award her with our Scholarship for Students with Self-Employment Experience. We wish you all the best in achieving the goals you have set out to accomplish, Anna!